Palladino RV offers you this 2018 Starcraft Autumn Ridge OUTFITTER 18QB. Visit our store or make a request online for more information on this vehicle. LAST NEW 2018 AUTUMN RIDGE OUTFITTER 21BFS. THIS LIGHT WEIGHT TRAVEL TRAILER HAS 1 SLIDE, 2-20LBS PROPANE TANKS, 12V MARINE BATTERY, LIGHT INTERIOR COLOR, STOVE, MICROWAVE, PROPANE/ELECTRIC FRIDGE, AWNING,COME BY AND SEE IT. BEAUTIFUL COUPLES COACHNEW 2018 STARTCRAFT OUTFITTER 23RLS TRAVEL TRAILERUNLOADED WEIGHT 5445 LBSWALK AROUND QUEEN BED, LARGE CORNER SHOWER, DINETTE SLIDE LOADS OF COUNTER SPACE, SLEEPS 6 IF YOU NEED THAT EXTRA SLEEPING SPACEPOWER TONGUE JACK, 2 30LBS PROPANE TANKS, POWER AWNING, SPARE TIRE.2019 SALE PRICED AT $ 23866.00 PLUS ADMIN, TAXES AND LIC FEES. Palladino RV offers you this 2018 Starcraft Autumn Ridge OUTFITTER 26BHS. Visit our store or make a request online for more information on this vehicle. When it comes to choosing an RV/camper manufacturer, we recognize you have a lot of options. At Starcraft RV, we believe in pushing boundaries. We take great pride in our history as a travel trailer and fifth wheel RV manufacturer and continue our quest to exceed the expectations of our customers and our industry while being good stewards of the environment. Below are just a few of the reasons we think Starcraft is a one-of-a-kind choice for your next recreational vehicle.Starcraft RV 3-Year Warranty===== THREE-YEAR WARRANTY =====At Starcraft, we are proud to back our RV brands with a 3-Year Limited Structural Warranty plus a 1-Year Limited Manufacturer's Warranty---freedom from worry is your best travel companion.===== MAGNUM ROOFTM SYSTEM =====Magnum Roof System Starcraft RV==== STRONGER IS BETTER ====Strength is one of the basic principles of engineering. The stronger something is built, the longer it will last. As an experienced travel trailer and fifth wheel RV manufacturer, we understand strength comes from within, which is why we focused on the smallest of details when constructing the Magnum RoofTM system. From sturdier vertical studs to 7 header beams, we pride ourselves on staying at the top of our game -- building stronger brands that last. GREAT FAMILLY TRAVEL TRAILER HERE AT PALLADINO RV. THIS SPACIOUS 2018 AUTUMNRIDGE 282BH AS 1 SLIDE, POWER AWNING, BUNK BED AND QUEEN, SLEEPS 9. PROPANE/ELECTRIC FRIDGE, HEAT/AC, PLENTY OF STORAGE, PDI INCL. AND MUCH MORE. HOT NEW 2019 LAUNCH OUTFITTER 24ODK, THIS MID SIZE UNIT HAS LITE INTERIOR COLORS, 1 SLIDE, ELECTRIC AWNING, OUTDOOR KITCHEN, SOLAR READY, PASS THROUGH STORAGE, PROPANE/ELECTRIC FRIDGE, STOVE AND MICROWAVE, LARGE PANTRY, BUNKS AND QUEEN BED, ITS A MUST SEE. THIS BEAUTIFUL 18RBE IMAGINE XLS FROM GRAND DESIGN AS MANY FEATURES IN ITS LIGHT WEIGHT FRAME 4,097 UVW. SPRAY PORT, LP QUICK CONNECT, ALUMINUM STEPS, PASS THROUGH STORAGE, MURPHY BED, BOOTH DINETTE, SPACIOUS BATHROOM, PROPANE/ELECTRIC FRIDGE. FOR MORE INFORMATION, CONTACT ONE OF OUR SALES STAFF. HOT OFF THE PRESS, AMAZING FLOOR PLAN FOR THIS 2020 GRAND DESIGN TRANSCEND 265BH BUNK HOUSE TRAVEL TRAILER , COMES IN UVW AT 6386LBS, PRIVATE MASTER BEDROOM , LARGE BATHROOM, LOADS OF STORAGE AND COUNTER SPACE IN THIS BEAUTIFUL KITCHEN LAY OUT, BUNKS WITH FRONT SOFA THAT ALL PULLS DOWN FOR EXTRA SLEEPING AREA- UNIT CAN SLEEP UP TO 10, JUST SO MANY OPTION TO LIST ON THIS 2020 ITS A MUST SEE IN PERSON AT OUR DEALERSHIP! A MUST SEE, THIS 2018 STARCRAFT AUTUMN RIDGE OUTFITTER 31BHU SLEEPS 10 WITH A SEPERATE ROOM, 2 SLIDES, AWNING, 2 OUTSIDE DOORS, LARGE PASS THROUGH, PROPANE/ELECTRIC FRIDGE, OUTSIDE KITCHEN, VERY NICE UNIT. COME VISIT US AT 890 NEWGATE AVE.
NEW 2017 Starcraft Launch Grand Touring 299BHS Travel Trailer priced for quick sale, Full Manufacture warranty Visit our store or make a request online for more information on this vehicle. WHAT A GREAT LAYOUT ON THIS NEW 2019 STARCRAFT AUTUMN RIDGE 27RLI. ITS HAS 2 SLIDES,PASS THROUGH STORAGE, ALUMINUM SIDING, DOUBLE AXLE, POWER AWNING, CENTER ISLAND, TRIFOLD COUCH, PROPANE/ELECTRIC FRIDGE, QUEEN BED, BOOTH DINETTE, SLEEPS 6. COME TAKE A LOOK MON-SAT. THIS LIGHTWEIGHT TRAVEL TRAILER 2019 GRAND DESIGN IMAGINE XLS 22RBE IS QUITE SPACIOUS. 1 SLIDE, ALUMINUM AWNING, SPRAY PORT, ALUMINUM STEP, LARGE BATHROON, QUEEN BED, SLEEPS 2, PROPANE/ELECTRIC FRIDGE, 70 SOFA REMOVABLE TABLE. IF YOUR LOOKING FOR A TRAVEL TRAILER, FIFTH WHEEL, TOY HAULER, MOTORHOME WE ARE SURE TO HAVE WHAT YOU ARE LOOKING FOR! While great effort is made to ensure the accuracy of the information on this site, errors do occur so please verify information with a customer service rep. This is easily done by calling us at (705) 524-1912 or by visiting us at the dealership. **With approved credit. Terms may vary. Monthly payments are only estimates derived from the RV price with a 96 month term, 4.9% interest and 20% downpayment. TOGETHER LETS MAKE CAMPING MEMORIES! 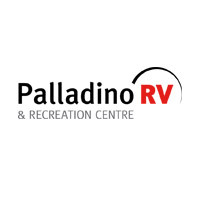 Welcome to Palladino RV & Recreation Centre, your number one destination for all of your RV needs and products in the Greater Sudbury area. At Palladino RV & Recreation Centre, we are passionate about RVs, and dedicated to satisfying the needs of those who share our passion. Palladino RV & Recreation Centre	46.5134268, -80.9840007.